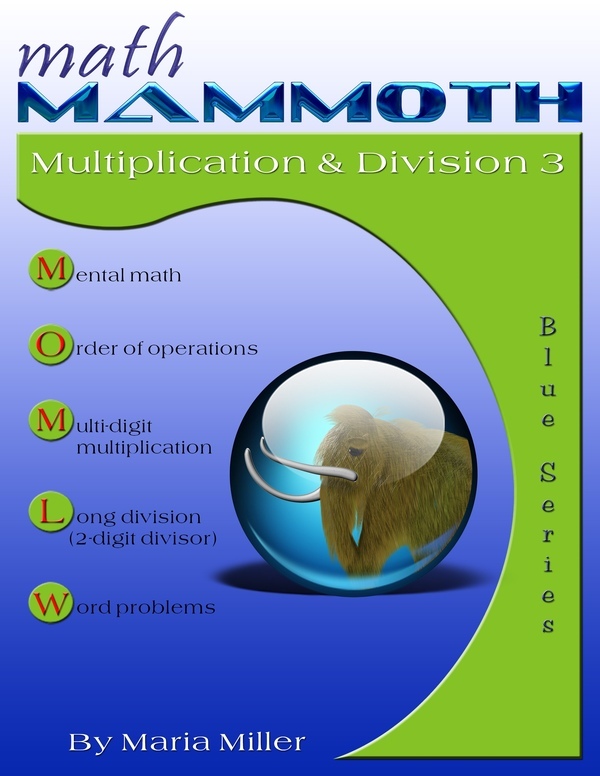 Math Mammoth Multiplication Division 3 - workbook for fifth grade. Download and print. 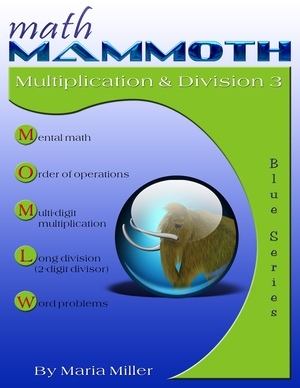 Math Mammoth Multiplication Division 3 covers multiplication and division related topics, such as the multiplication algorithm, long division, estimation, divisibility, factoring, and ratios. This book also contains many lessons that aim to develop students' algebraic thinking, and get them used to simple equations. The book is aimed for 5th grade but can probably easily be used in 6th grade as well. One important line of thought throughout this book is that of equations. Students encounter the exact definition of an equation and an expression. They practice the order of operations with problems that also reinforce the idea of the equal sign ("=") as denoting equality of the right and left sides of an equation. These kind of exercises are needed because children may think that an equal sign signifies the act of finding the answer to a problem (as in 134 + 23 = ?, for example), which is not so. Simple diagrams are used to illustrate simple multiplication and division equations and mixture equations, such as 4x + 38 = 128. The idea is see how the four operations are used together in solving problems and in simple equations. We are trying to develop students' algebraic thinking, including the abilities to: translate problems into mathematical operations, comprehend the many operations needed to yield an answer to a problem, "undo" operations, and so on. Many of the ideas here are preparing them for algebra in advance. In the middle of the book are lessons on multi-digit multiplication (multiplying in columns). These lessons go farther than just reviewing the well-known algorithm. We study in detail: multiplying in parts (partial products), how those partial products can be seen in the algorithm itself, and how multi-digit multiplication can be visualized geometrically. Students also practice long division, including two-digit divisors. Then we study divisibility, prime numbers, and factoring, including the sieve of Eratosthenes. The lesson Introduction to Ratios is important, as it shows the connection between fractional parts, ratios, and bar models. You can make additional worksheets for long multiplication and long division on this web page. Scroll down to the multiplication and division sections.